As I said here, I think there is room for a radically simple universal second language, whose main characteristic would be that you could learn all of it (except vocabulary) in half a day. 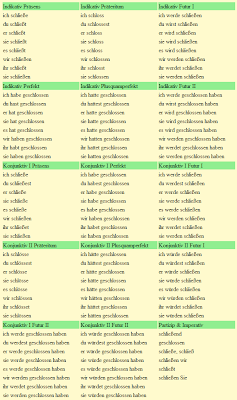 This post aims to cover verbs in such a language. 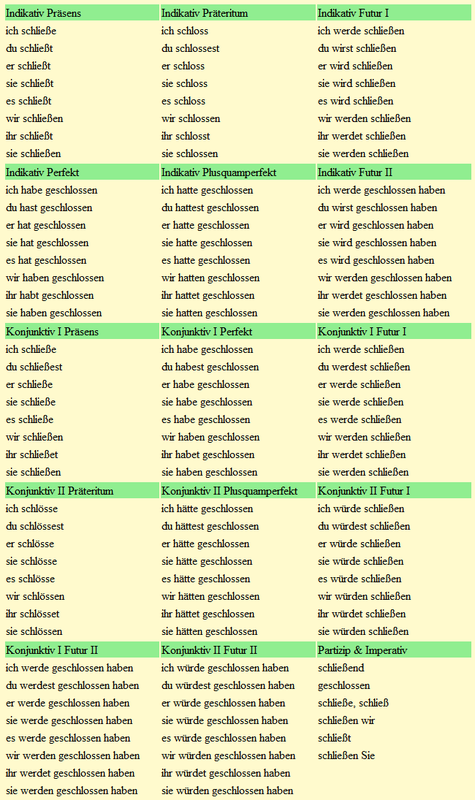 The heading picture, from http://conjd.cactus2000.de/index.en.php, shows a conjugation table for one German verb, not even a difficult one. How long before you could use that at normal talking speed? I think we can do better than that – or at least do something simpler & quicker to learn & be able to use. Say our new language has a verb 'hit'. You can guess what it means. This one invariable word - & I want to stress that absolutely ALL words should be invariable – will be the infinitive. It will also be the present tense, for any & every subject. I didn't mention the invariable word order: subject-verb-object. To make a past tense, just add the invariable word 'did' after the infinitive. Note that, in general, all qualifying words should come after what they qualify, unlike in English. To make a future tense, add the invariable word 'wil' after the infinitive. Combinations of passive & others are possible & obvious. Most languages have lots of additional tenses & moods. See the Wikipedia German link above. They certainly add possibilities for subtlety & refinement. I think a basic language can & should manage without. In the interest of simplicity, above all. To learn any verb, you just learn one word, which stays invariable. You know everything about every verb.